« Is it for real? Markets are stagnating since the start of our lunar Red period last week. No significant downside action has occurred so far, but there is more Red period to come. This market has broken above an important resistance level at 1450, and is now consolidating the gains. If it can stay above 1450 for the remainder of the current lunar Red period, then we will be well set for further gains in early October. The S&P may then go on to new highs by the end of the year or in 2013. If the 1450 level does not hold, then I would become more cautious and prepare for a possible drop to 1350. So we have to watch very carefully. 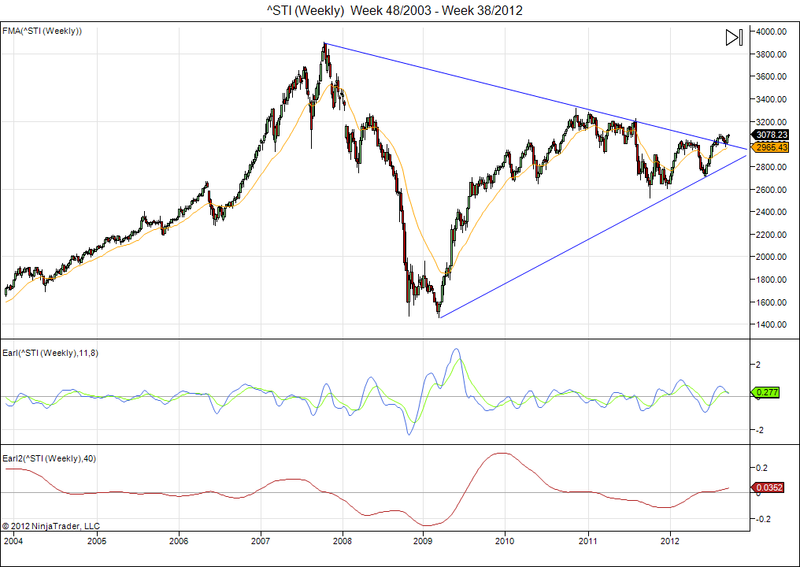 This market is climbing out of a very broad triangle formation, and is currently consolidating. My Earl2 indicator, which bottomed in late 2011 for this market, is not yet showing signs for a top. A break above the 3200 level would open the way to go back to the 2007 highs. You can buy this market with a stop-loss near 2800, which means you risk 10% with the potential of gaining 30% (when the market goes back to 2007 highs). That’s not a bad risk/reward ratio. This entry was posted on September 24, 2012 at 12:42 pm	and is filed under Market Commentary. You can follow any responses to this entry through the RSS 2.0 feed. You can leave a response, or trackback from your own site.